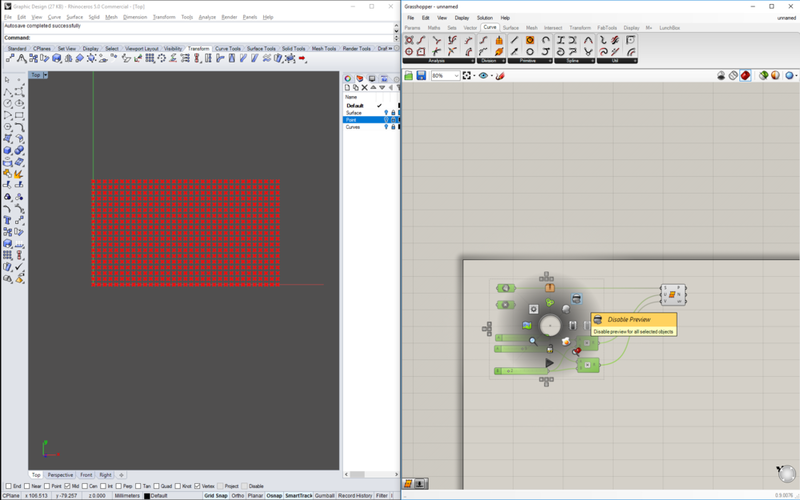 We will start this lesson from where we left off in the Intro to Grasshopper tutorial. If you are just joining us, in Rhino, we made a surface that is 80x45 mm and placed a point in the middle. I will shorten some of my instructions, so for example, instead of saying under the Parameter tab inside of geometry panel theirs an point component, I will write Parameter Tab > Geometry > add Point. You can also double click on the work space and just type the tool name for an even quicker workflow, in this case Point. Delete the Color swatch and Preview component from the previous Algorithm. We will use them later. Here we will make a simple grid of points based off our surface. We will use math to keep our grid the same ratio as our surface. Connect 16 to one slot A and 9 to the other. This helps keep the preview less cluttered. In math domains are incredibly important and valuable. It is the basis of scaling. Lets imagine we have a dice with 10 sides. You roll the dice 5 times and you get 7, 6, 8, 5, 6. The domain of that dice is 1-10 so we got 5 random numbers in that domain. Now these numbers are relative to each other and their domain. So if I take this information remap it to another domain, let's say 0-100, my numbers will become 70, 60, 80, 50 and 60. Here is an example of what that looks like. We will cover this more in detail on the next page.